Apple has discontinued the compact wired keyboard. This particular keyboard first showed up early in 2009 and was different in that the numberpad had been chopped off the right hand side. 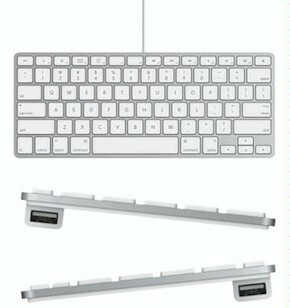 The part number for the keyboard is MB869LL/A and has been removed from Apple’s store although there are still some supplies floating around places such as Amazon where you can grab it for $46.99, $49 now. What the key difference is between this and the wireless version (other than the lack of wires obviously) is that this keyboard had a couple of USB ports, one on each side, right where the stand is to prop up the keyboard at an angle. The wired numberpad version is still available, so we are not sure if Apple is either going to do away with wired keyboards, or do away with numberpad-less keyboards.